In addition to Christmas and New Year, we are celebrating Savvy Sis' birthday as well. I think birthdays are pretty special, which a person deserves to be super special for the day. One of my favorite things to do is finding unique cakes for birthdays and celebrations as I adore sweets. My friends call me "The Dessert Gal". SG wanted to buy a custom cake for Savvy Sis but after all the eating this couple of days, I figured flowers might be a better option. This way, she gets a beautiful cake without any of the calorie. We are having cupcakes for her birthday this year since we are able to buy all sorts of flavors. And, the kids enjoy cupcakes more! 1. Cupcake style cake $200 --- These cakes are super unique with lots of wow factor but expect the cake and buttercream to be very rich and dense in order to support the shape. 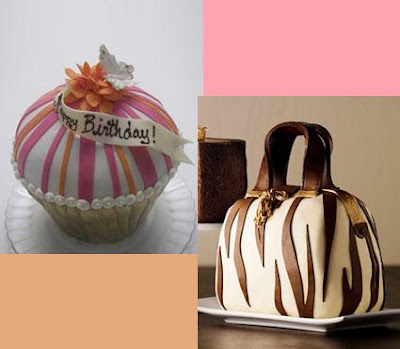 Wow--the cupcake & the purse are amazing! They're all gorgeous. How do you find such lovely things?! I usually look high and low for special items. I believe in giving the best (within my ability) whenever I am going to give a gift. My feeling is if I am going to do something, it's savvy to do it right. happy hols honey,the cakes are beautiful darling,what day is your birthday beautiful? happy birthday in advance,hope you find the perfect cake. 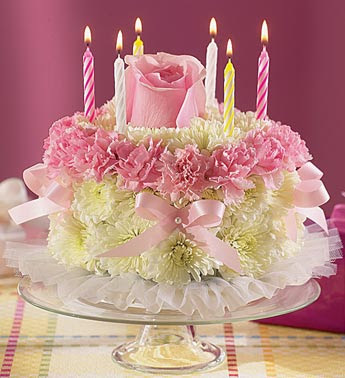 The flower cake is very cute too, a good idea! (Though I'm not the hugest fan of carnations, these are very tastefully done!). Thanks for your kind and warm wishes Savvy. Look like you have a great fun these holidays celebrating so many occasion together! I love eating cakes too, they are my inspiration to continue life not just to celebrate, but knowing the reason behind. My late mother's birthday was on Christmas Day. I miss her friendly smile and I promise myself to continue my life journey in a even more meaningful way....... to glorify GOd and her. Happy Birthday to Savvy Sister!!! Oh I think you're right B-days must be special!! I love those cakes, so beautiful. And the flowers cake is such a good and amazing idea!! You always find these stuning things, thanks for sharing with us. Those are AMAZING cakes! Some heavy price tags... one must enjoy every bite! looks so yummy. mmmmm. lol.